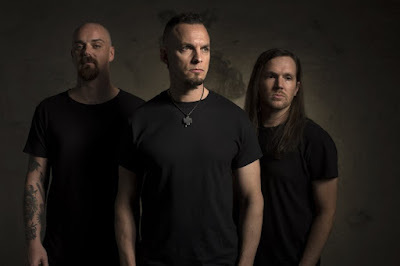 Alter Bridge offshoot Tremonti are streaming a lyric video for the title track to their forthcoming concept album, “A Dying Machine”, as the lead single and first preview of the record ahead of its June 8 release. Produced by longtime band associate Michael "Elvis" Baskette, the group’s fourth project takes place at the turn of the next century where humans and fabricated beings called “vessels” are trying to co-exist. The story is being turned into a full-length work of fiction by guitarist Mark Tremonti and American author John Shirley, and will be issued alongside the record. Tremonti will preview new music from “A Dying Machine” on a series of US dates in May before launching the album on a summer tour of Europe that will begin with an appearance at the Firenze Rocks festival in Florence, Italy on June 17 followed by headline dates starting in Munich, Germany the next day. The trio of Tremonti, guitarist Eric Friedman and drummer Garrett Whitlock will be joined by bassist Tanner Keegan for the 2018 tour in place of former bassist Wolfgang Van Halen.